These are watercolor paintings which I have done with my students as class exercises. You are welcome to try they out yourself if you like. My original photo reference and the finished watercolor painting are included. This is my latest watercolor painting of Venice it features the leaning tower of San Giorgio dei Greci which means “Saint George of the Greeks.” It is a Greek Orthodox Cathedral. I never get tired of painting scenes of Venice, the atmosphere, sense of history, and myriad of textures and earth colors, all say paint me! 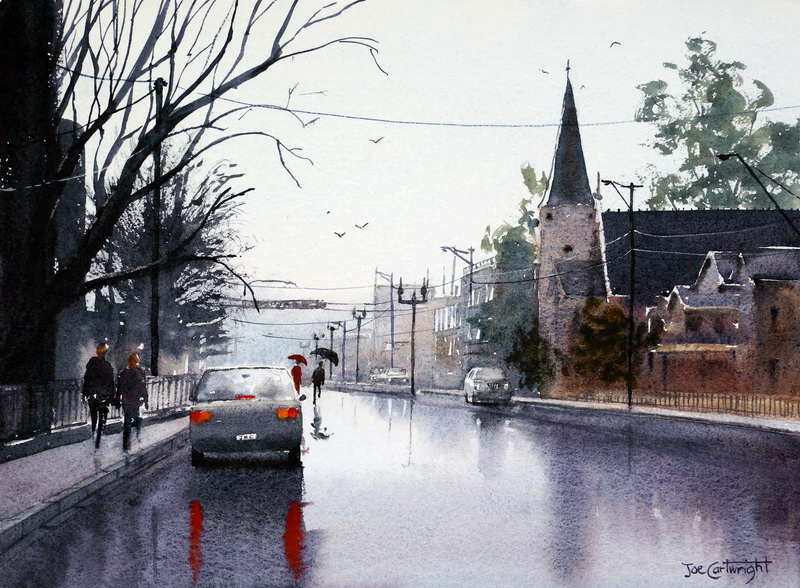 Watercolor is particularly suited to painting these atmospheric scenes. The painting is based on a photo I took a few years ago while holidaying in Venice. 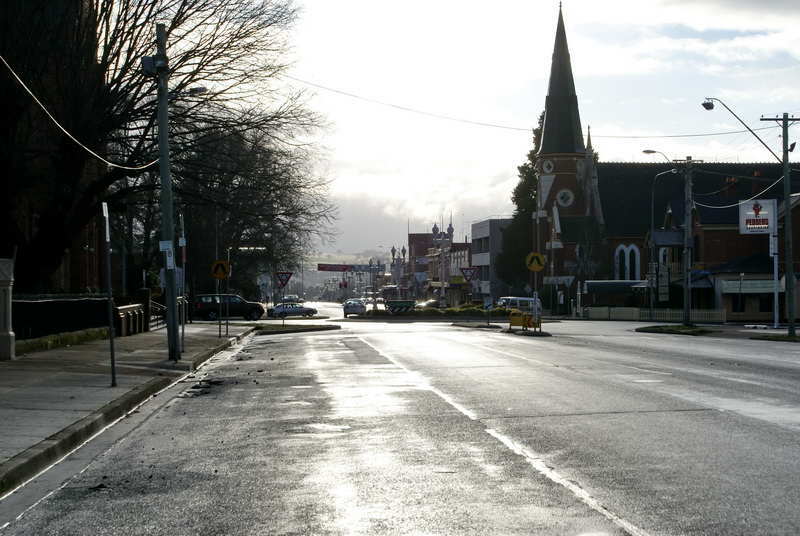 You can see that it was taken on quite a bright day. For my painting I altered the sky to give the scene more mood. I also decided not to put in the blue striped poles on the bottom right had side as they were too prominent. 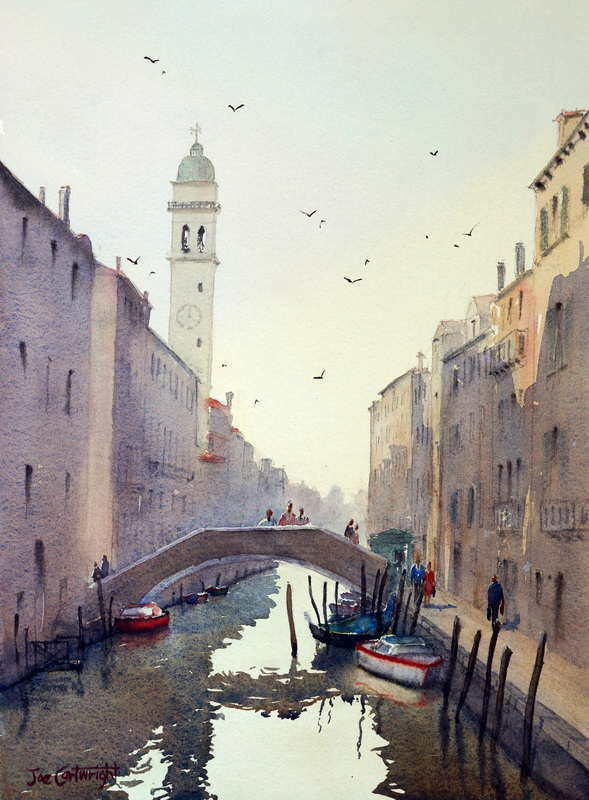 Drawing a scene like this, where buildings are not parallel to one another as the canal varies in width can be a challenge. Also some of the buildings lean one way or the other. The trick is not to draw them with a single vanishing point but have the lines that converge on a vanishing region rather than a single point. You can see this in the image below. I have marked eye level as just above the bridge height. 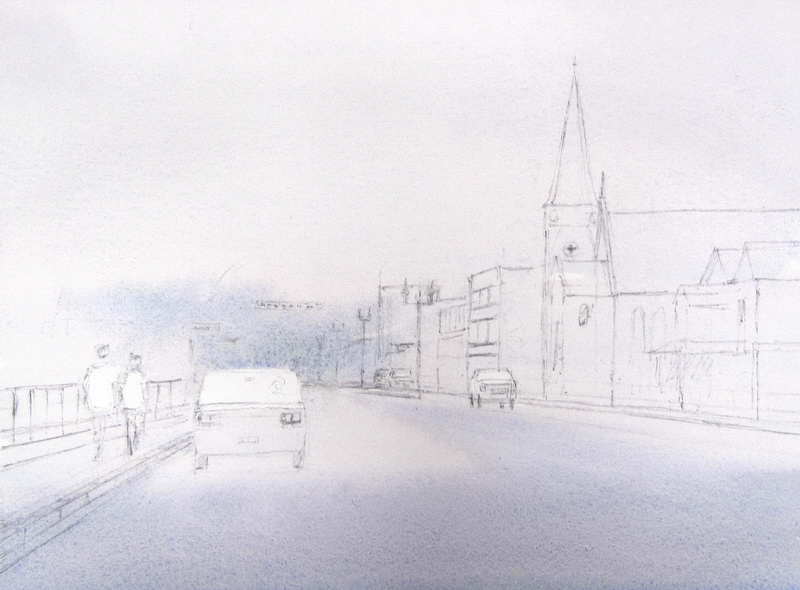 On a flat straight road with building fronts parallel to the roadway, all the lines moving away from the viewer such as window lines, would converge on a single point, know as the vanishing point, somewhere on eye level. However all such lines in this scene converge, not at a single point, but in a general region. 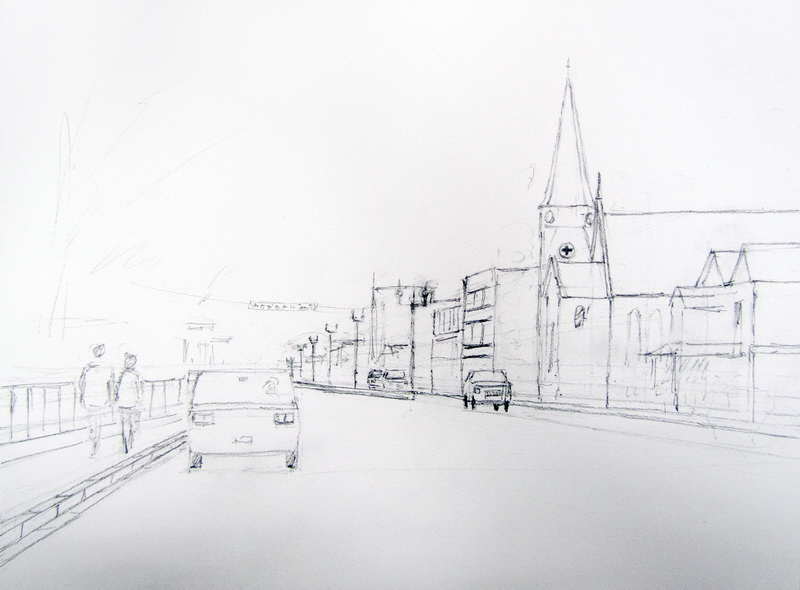 As long as these key lines converge in the same general area the perspective in your drawing should look OK. Another way to look at this is that each building will generally have its own vanishing point, as in typical perspective scene, however the vanishing point will not necessarily be the same for all buildings an structures. 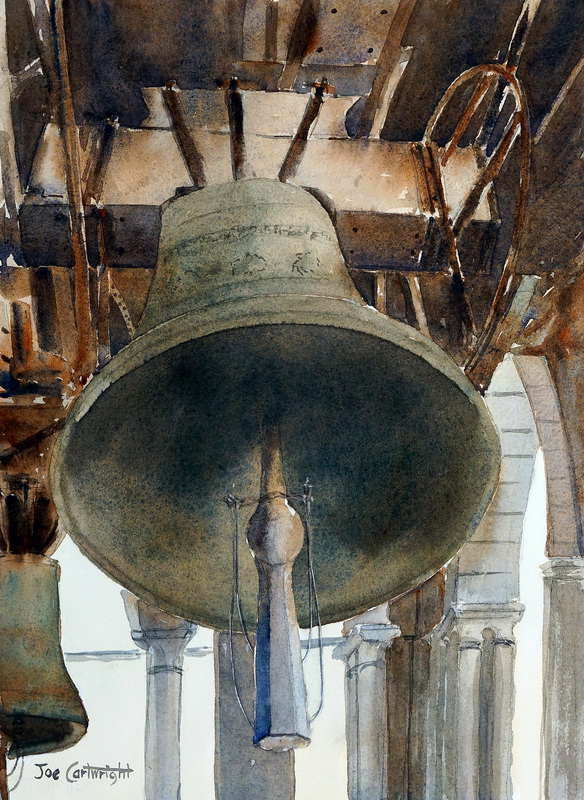 This watercolor painting of bells, specifically the Bells of St Mark’s Campanile, the the Bell tower of St Mark’s Basilica, in Venice, Italy, was completed by my class last week. It was a subject they had not done before and I thought it would give them some good practice with drawing curved shapes. It also allowed me to discuss the subject of negative space drawing as many of the positive shapes were really defined by painting or drawing the shapes between them. The reference photo I used was one I took in 2010 when I visited Venice for an extended painting holiday. I liked the abstract pattern of light formed by the window openings contrasting with the dark shapes above. It was also something not many people take the time to look at when they go up to the top of the tower. The view from up there is wonderful but I took the time to have a good look inside as well! 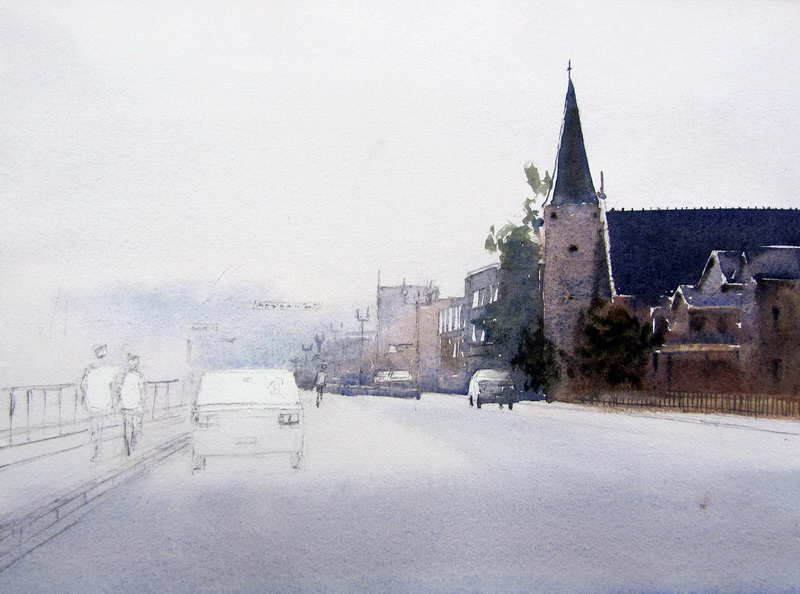 One never knows when a watercolor painting subject will present itself. 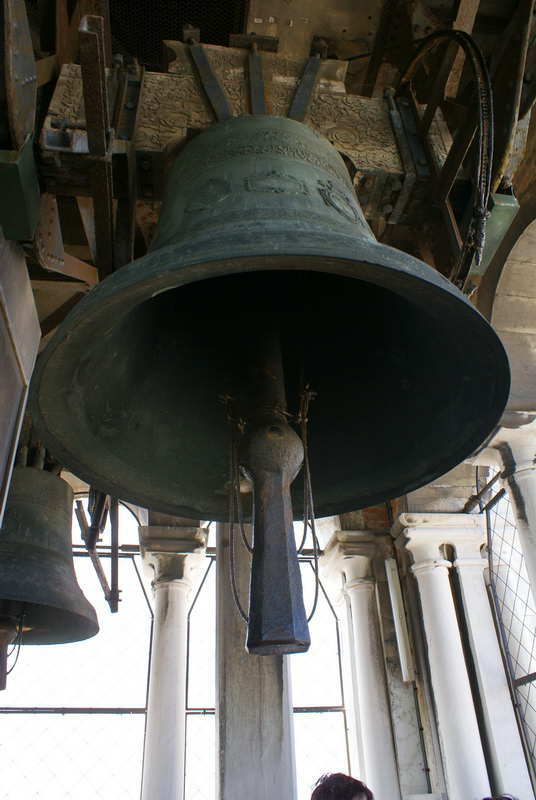 Bells of St Mark’s Campanile in Venice. 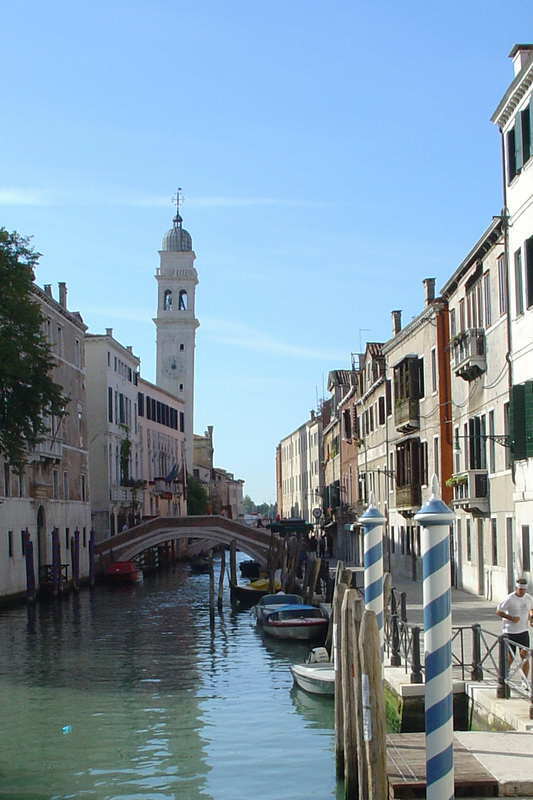 The Campanile is the Bell Tower of St Mark’s Basilica. After completing a loose drawing of the scene I began my painting with a wash of varying strength mixes of burnt sienna, cobalt blue for the timber and iron parts of this painting. The Bell color was primarily watercolor mixes of burnt sienna and cobalt turquoise. The columns were a light grey made with cobalt blue and a little burnt sienna with lots of water. I wanted to capture the feeling of the energy of these big bells and their complicated timber supports. Consequently I was not trying for photo realism in the painting, especially in the timer and iron support structure. It would have taken too long to achieve and I like to paint my watercolors quickly. I find that the more detail I try to put into a painting the less emotional connection I have with it. My greatest pleasure when painting is to see the watercolor paints flow on my paper and mix in a semi uncontrolled fashion. I find this very exciting. Everyone has a direction they like their watercolor paintings to go towards and this is mine. After the initial watercolor under painting had thoroughly dried I painted the details concentrating on the tonal pattern of lights and darks in the scene. Here is the finished watercolor painting. At some point I will do a full demonstration painting article on this subject. In the meantime if you have some questions please let me know by leaving a comment below. 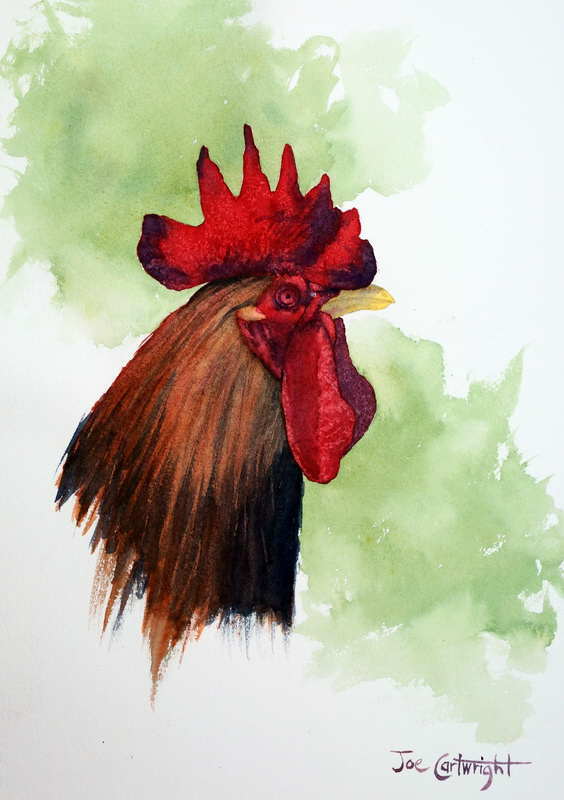 I did this watercolor painting of a Rhode Island Red rooster recently as part of a series on animals I am doing with my watercolor painting students. This subject can be tackled in various ways and I used two different techniques with my two classes. In the first watercolor painting I built the red watercolor wash of the bird’s comb and wattle (the red bits) in a number of glazes. In the second version I did it mostly in just one wash. Here is the reference photo I used for these watercolor paintings in case you would like to have a go at it yourself. 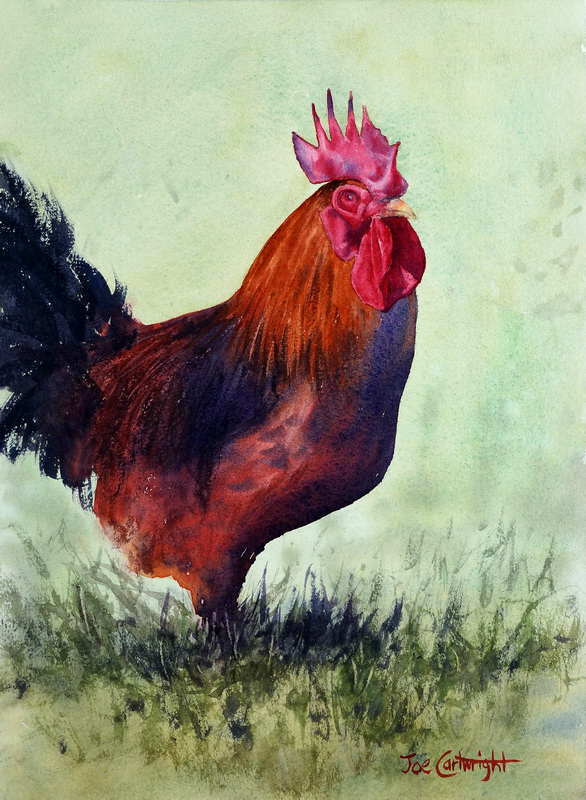 The reference photo is of a Rhode Island Red rooster on a friends farm. 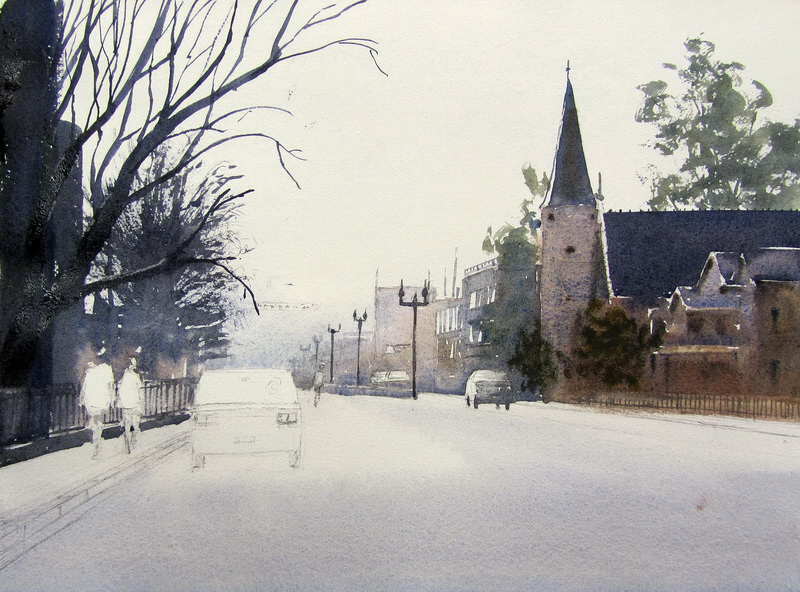 Below are the two watercolor paintings of the same subject . In the first example I built up the color with a number of layers of watercolor paint. I made sure each layer was totally dry before I placed the next one on top. It was in the second layer that I sprinkled salt where I wanted to create texture. The salt was sprinkled while the wash was still wet and left to dry. Afterwards I brushed off the dry salt. 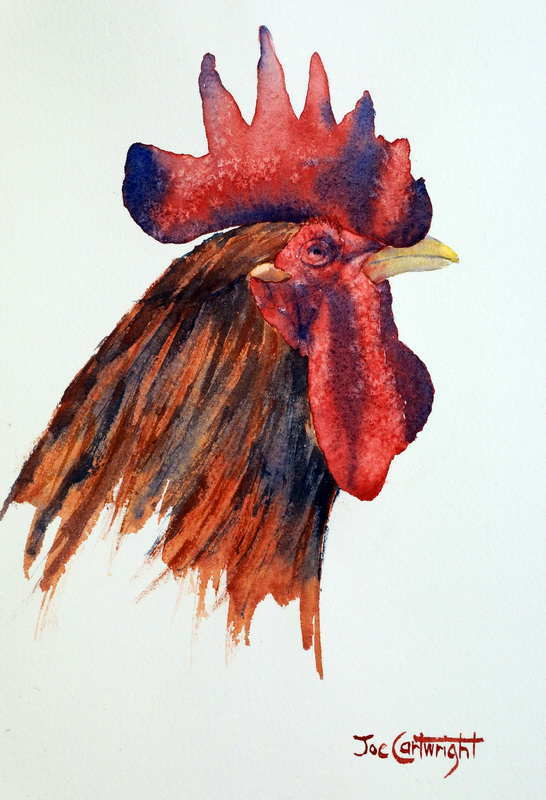 In the second watercolor painting of this Rhode Island Red rooster I painted most of the comb and wattle of the rooster in one go, the salt was used at this time as well. You can see that in the first example the watercolor is much stronger and vibrant than in the second example. The reason for this is the extra layers of paint used. The green background, being the complement of red, makes the red appear brighter as well. You can see in the second example that the watercolor is a lot lighter though it has a fresher feel to it. There is no right or wrong way to paint this subject. 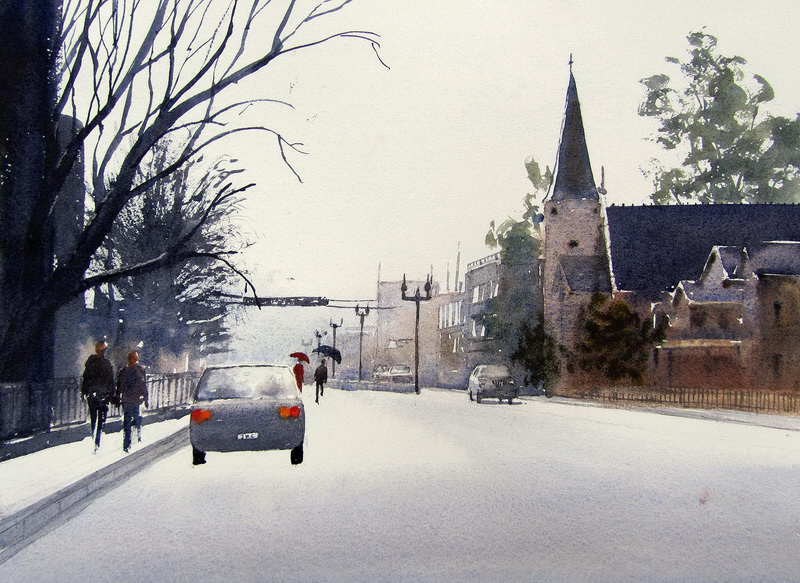 I have given you these two watercolor painting examples to show just two ways in which this subject can be tackled. I can think of many more. I will be producing a full demonstration article on how these paintings were done in the coming months once I get through a few projects I have under way. 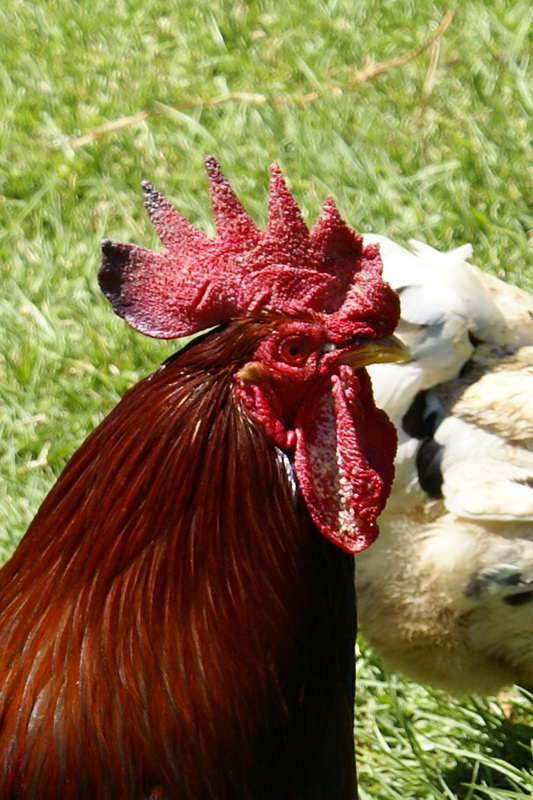 Below is another version of this rooster this time the body is shown as well.